Published: Oct. 15, 2017 at 04:42 p.m. Published: Sept. 24, 2017 at 02:22 p.m.
Minnesota Vikings cornerback Trae Waynes has an interception on Tampa Bay Buccaneers quarterback Jameis Winston. Published: Jan. 2, 2017 at 09:11 a.m. 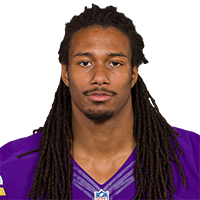 Published: Sept. 25, 2016 at 02:34 p.m.
Minnesota Vikings defensive back Trae Waynes intercepts QB Cam Newtown right before half time.